The king asks the philosopher what is the import of community, how can people who come from different backgrounds learn to trust one another. The philosopher illustrates his answer with the tale of talking animals: a crow, a gazelle, a tortoise, and a mouse. 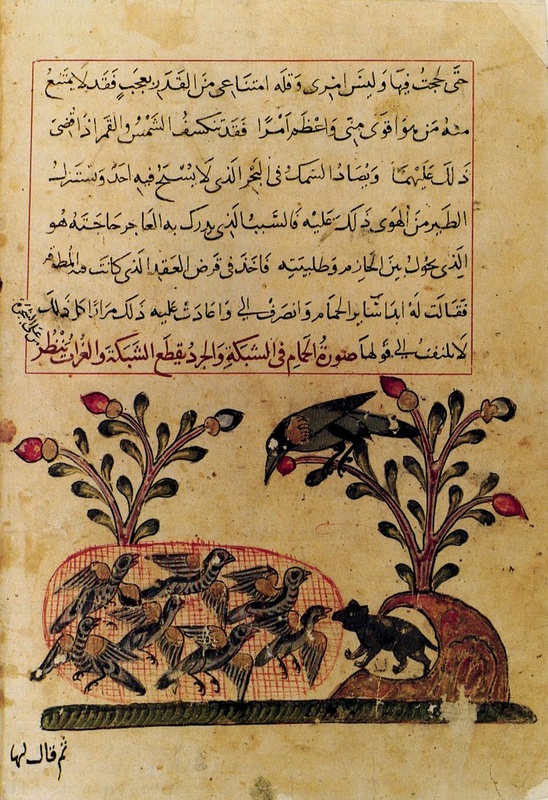 “The Ringdove” is found in the literary classic Kalila wa Dimna, a collection of fables based on the Panchatantra that Ibn al-Muqaffa—“one of the most brilliant exponents of the classical age of Arabic literature”—translated into Arabic in the eighth century from the Sanskrit original via a Persian version. The philosopher tells the king, and tells us today, twelve centuries later, community is everything—especially when times are tough. He might also be saying, don’t hang out with tortoises; they can cause you trouble. Source: Esin Atil, Kalila wa Dimna: Tales from a Fourteenth-Century Arabic Manuscript, Smithsonian Institution, 1981.